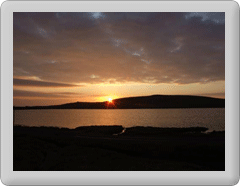 While Fetlar is a wonderful place to visit, it is a remote island and does not have many of the services which would be taken for granted in many parts of Britain. This is especially relevant during the period outside the main tourist season from May to August. When visiting the island please be aware that there is no doctor on the island. There is a highly trained district nurse, but backup does have to come from outside. Therefore we recommend you do not travel to the island if you are feeling unwell with symptoms which may indicate a serious condition e.g. chest pain. Please have any potential problems checked out at either the hospital in Lerwick or one of the health centres on the larger islands, such as Yell or Unst, before travelling to Fetlar. If you have a need for any sort of medication, please do make sure that you have taken sufficient supplies with you to last your stay. The nurse only has supplies to deal with emergency situations. Also if you are potentially likely to need any medication - perhaps for insect bites - please also take supplies with you. The health centres on the larger islands do have dispensaries. However, you will need to register as a temporary resident and see a doctor in order for medicines to be prescribed and dispensed. Most major breakdown services have agents working in Shetland. However these are for the most part Lerwick based and could take a considerable time to reach you. If you are having trouble arranging help or have no breakdown cover, please contact the development office and we will try and arrange help for you. Tel 01957 733369. There is no fuel available on the island so please make sure you have sufficient before visiting. There are a number of places to get fuel on the neighbouring islands of Yell or Unst before visiting. There are two electric vehicle charging points available at the Fetlar Interpretive Centre. these can supply at up to 22Kw, or at a lower power depending on your vehicle. These are on the charge your car network, but guest tags are available. Fetlar shop operates a cafe facility during shop hours, however prior notice is appreciated if your visiting outside of the main summer tourist season or travelling with a group. They supply light meals, snacks and drinks. Please check the shops webpage for latest opening times which vary seasonally. The Fetlar Interpretive Centre is open from May to September every day and also opens in October and April on demand, by prior arrangement. It can provide hot drinks such as Tea, Coffee and Hot Chocolate. Fetlar Developments operates a vending machine providing cold drinks and snacks at the Hamars Ness ferry terminal. This machine is located in the waiting room and is generally available 24/7. In the event of services not being available, for example due to power outages,information is normally displayed o the electronic noticeboards at the ferry terminals at Gutcher and Belmont as well as Hamars Ness and on the tourist information board in the ferry terminal waiting room on Fetlar. If you are travelling with babies or children please ensure that you have food for them with you. In the event that you have forgotten something and/or are in need of general assistance please either call at the development office, located at the public hall (call 01957 733369), or do ask at a house. The people here are very welcoming and will do what they can to help. If the nurse cannot be contacted, phone the Yell Health Centre on 01957 702127. Or in emergency situations dial 999.